This article contains two sections: an Apache Server section, and an Anchor Server section. You must configure Apache with an SSL certificate in order to allow mobile devices to connect. You must also configure an SSL certificate for your Anchor application server to support desktop client connections and WebDAV. In order for mobile devices to log in, a valid CA signed SSL certificate must be installed for Apache. Self-signed certificates are not supported. When you create a new SSL certificate or wildcard certificate, you generate a .key file (private key), as well as a .csr file (certificate signing request file), using your OpenSSL application. You then submit the .csr file to the SSL Certificate Authority of your choice (for example, GoDaddy, Thawte, Verisign, and so forth) in order to receive the appropriate .crt (certificate file)and bundle .crt files, which are then installed on your Apache web server. Note: This section outlines the full process for purchasing a new SSL certificate and configuring it for use. If you already have an existing SSL certificate, please copy your existing .key file, .crt file, and bundled .crt file into the C:\Apache24\conf\ssl\ directory, then skip to the Updating the SSLCertificateChainFile Path section below. Note: If you already have an existing IIS .pfx file, you must first convert it to a .key file using the OpenSSL application. For more information, please reference the How Do I Move SSL Certificates from IIS to Apache article. From the Start menu, enter cmd into the search box and press the Enter key. A new Command Prompt window displays. req -new -sha256 –key yourdomainname.key –out yourdomainname.csr -config "C:\Apache24\conf\openssl.cnf"
OpenSSL> req -new -sha256 -key yourdomainname.key -out yourdomainname.csr -config "C:\Apache24\conf\openssl.cnf"
When prompted to enter a Country Name, enter your country’s two letter code (for example, US). When prompted to enter a State or Providence Name, enter the full name of your state or providence (for example, California). When prompted to enter a Locality Name, enter the full name of your city (for example, San Francisco). When prompted to enter an Organization Name, enter the name of your organization. When prompted to enter an Organizational Unit Name, enter your organizational unit, or leave this field blank. When prompted to enter a Common Name, enter your server FQDN (for example, hostname.yourdomainname.com, or *.yourdomainname.com for a wildcard certificate). IMPORTANT: You must include a * symbol in front of your yourdomainname.com if you are registering a wildcard certificate. When prompted to enter your email address, enter a valid email address. IMPORTANT: Make sure you have access to the email account that you provide. Depending upon the SSL Certificate Authority you select, you might need to validate ownership of your domain. When prompted to enter extra attributes (a challenging password and an optional company name), leave these fields blank. 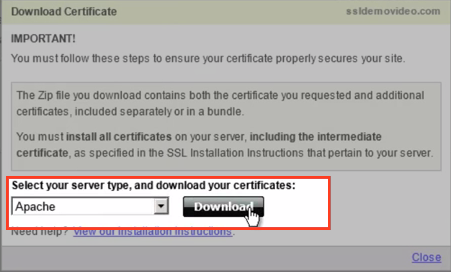 Purchase a certificate from an SSL Certificate Authority of your choice using your newly generated .csr file. For example, you may wish to purchase from GoDaddy, Thawte, Verisign, and so forth. Each of these Certificate Authorities will require a specific set of steps for submitting the content of your newly generated .csr file. Follow the specific set of instructions provided by your selected Certificate Authority. IMPORTANT: Depending upon the SSL Certificate Authority you selected, you might need to validate ownership of your domain. When prompted to submit your .csr file, you can access the file in the Apache directory (for example, C:\Apache24\bin\_.yourdomainname.com.csr). Your SSL Certificate Authority will provide you with two files: a .crt file and a bundle.crt file. 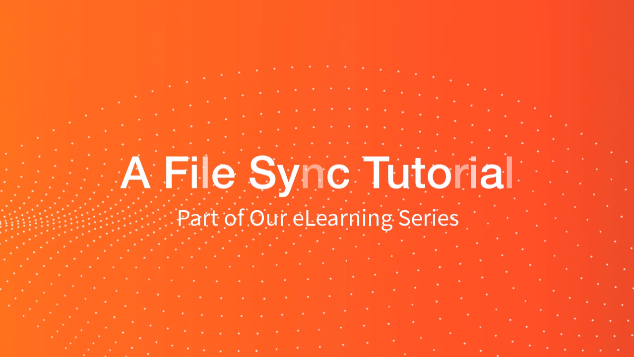 Make sure that you specify Apache server type when you download the files. Move the .crt file into Apache’s ssl directory (for example, C:\Apache24\conf\ssl\). Move the bundle.crt file into Apache’s ssl directory (for example, C:\Apache24\conf\ssl\). Move the .key file from Apache’s bin directory to Apache’s ssl directory (for example, from C:\Apache24\bin to C:\Apache24\conf\ssl\). NOTE: Please create a backup copy of the .conf file prior to editing. Navigate to Apache’s conf directory (for example, C:\Apache24\conf\) and open the httpd.conf file. In the Start menu, enter Services into the search box and press the Enter key. The Services window displays. 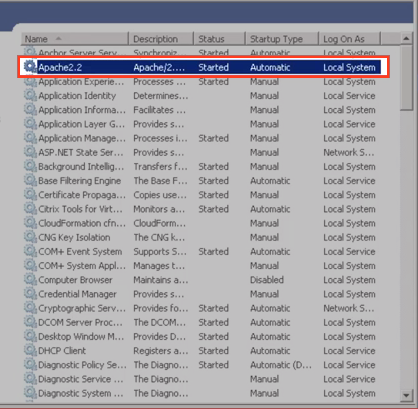 Right-click Apache Service and select Restart. The Apache Service will restart. You are also required to configure an SSL certificate for your Anchor application server to support desktop client connections and WebDAV support. Chain copies of your .crt file and bundle.crt together (these were generated when configuring SSL for your Apache server). Modify the C:\Anchor Server\conf\config.ini file to point to the new combinedbundle.crt and copied .key file. Open up the newly copied .crt file, SELECT ALL of its contents, and then COPY its contents. Open up the newly copied bundle.crt file and place your mouse cursor at the beginning of the document (before the first character). PASTE the contents of the .crt file into the top of bundle.crt. Save the modified bundle.crt file as combinedbundle.crt or other recognizable name. Save the config file and restart your Anchor Server Service.